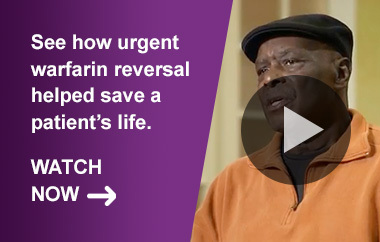 Effective hemostasis measured up to 24 hours for the Acute Major Bleeding trial and until the end of procedure (up to 24 hours) for the Urgent Surgery/Invasive Procedures trial. Rapid INR reduction to ≤1.3 at 0.5 hours after end of infusion. 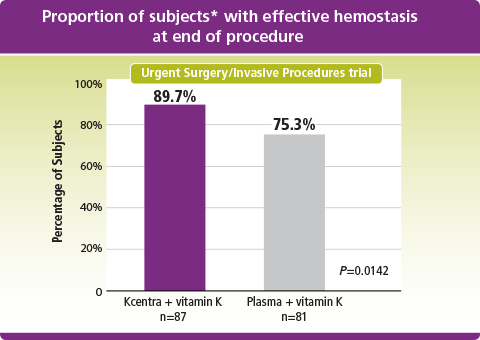 Superior hemostasis with Kcentra vs plasma in the Urgent Surgery/Invasive Procedures trial. 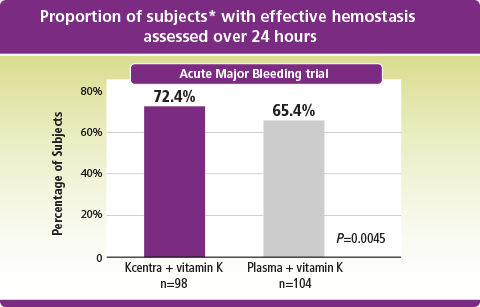 Equally effective hemostasis with Kcentra vs plasma in the Acute Major Bleeding trial. Kcentra–plasma (%) [95% CI] = 14.3 [2.8, 25.8] (prespecified noninferiority margin >–10%; Kcentra superior to plasma as lower limit of 95% CI >0). *Intent to treat-efficacy (ITT-E) population. Kcentra–plasma (%) [95% CI] = 7.1 [–5.8, 19.9] (prespecified noninferiority margin >–10%). Farrington–Manning P value for noninferiority, rejecting null hypothesis of inferiority of 4F-PCC. Superior speed in reaching INR of ≤1.3 within 30 minutes after end of infusion. *Kcentra—plasma (%) [95% CI] = 45.3 [31.9, 56.4] for noninferiority (prespecified noninferiority margin >–10% in the Urgent Surgery/Invasive Procedures trial; Kcentra superior to plasma if lower limit 95% CI >0). 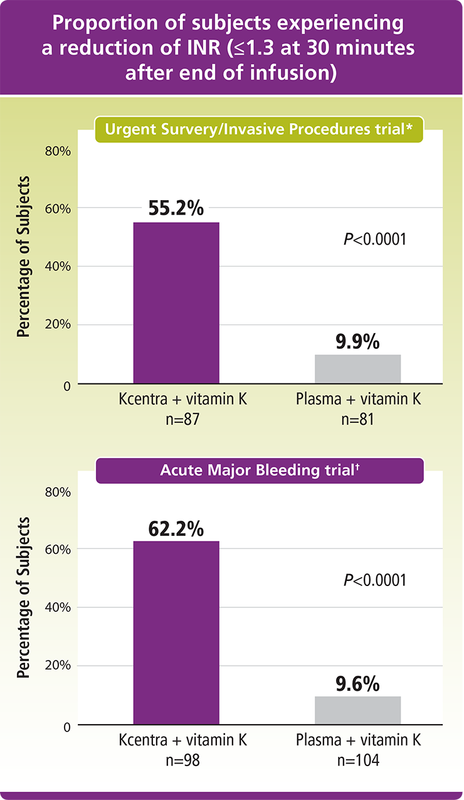 †Kcentra—plasma (%) [95% CI] = 52.6 [39.4, 65.9] for noninferiority (prespecified noninferiority margin >–10%; Kcentra superior to plasma if lower limit 95% CI >0) in the Acute Major Bleeding trial. 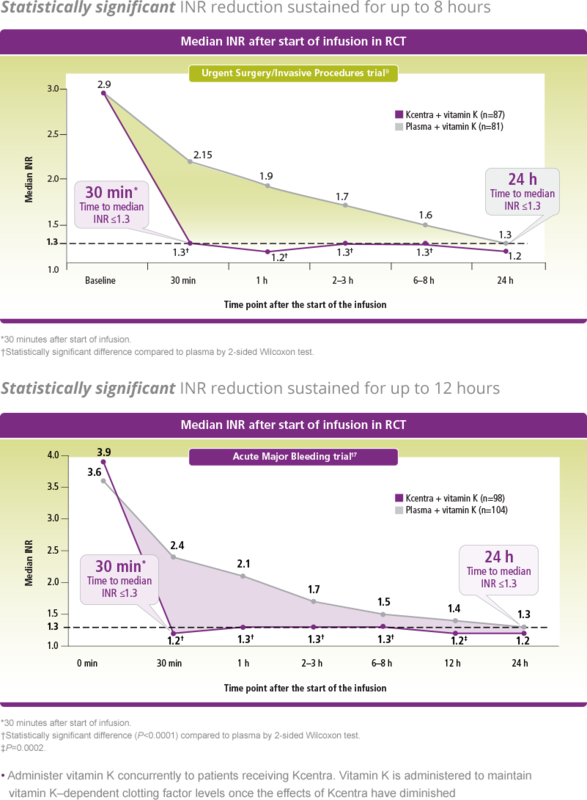 Statistically significant INR reduction sustained for up to 8 hours. *Statistically significant difference compared to plasma by 2-sided Wilcoxon test. *Statistically significant difference (P<0.0001) compared to plasma by 2-sided Wilcoxon test.